Conscience Cocktails, a networking group for young professional Angelenos with philanthropy as a commonality, will be hosting a holiday charity mixer on Wednesday, December 5th to benefit The Seany Foundation. 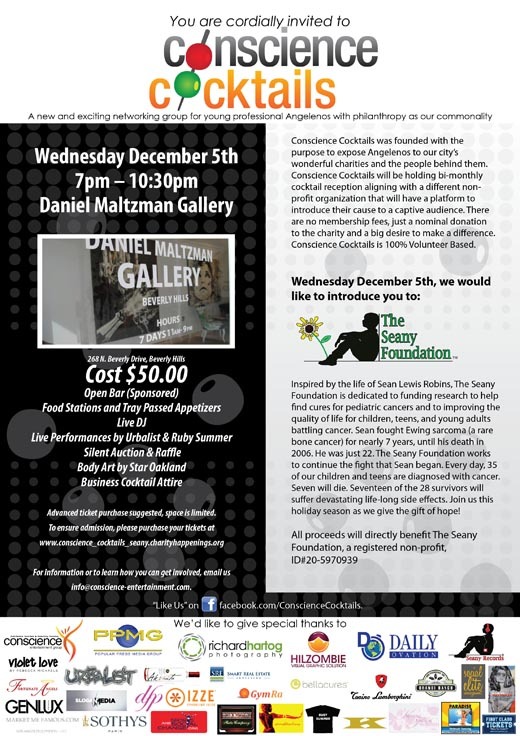 Join us from 7pm – 10:30pm at the Daniel Maltzman Gallery located in luxurious Beverly Hills for evening of socializing and philanthropy as we bring together like-minded people, great food and cocktails while raising money and awareness for The Seany Foundation. The mission of Conscience Cocktails is to expose Angelenos to our city's wonderful charities and the people behind them by aligning with a different non-profit organization at each event and giving them have a platform to introduce their cause to a captive audience. All proceeds directly benefit our evening's charity partner, The Seany Foundation. Every day, 35 of our children and teens are diagnosed with cancer. Seven will die. Seventeen of the 28 survivors will suffer devastating life-long side effects. Join us this holiday season as we give the gift of hope!